McCormick Cream of Tartar in Professional Chef size container. Cream of Tartar is the potassium salt of tartaric acid and is used to stabilize egg whites in baked foods. The chemical names are potassium acid tartrate, potassium hydrogen tartrate, and potassium bitartrate. Cream of Tartar is the acidic ingredient in many baking powders and reacts with the base sodium bicarbonate in the baking soda to make the bubbles that cause doughs to rise. To use Cream of Tartar to make your own baking powder: Combine 1/2 tsp Cream of Tartar, 1/4 tsp cornstarch, and 1/4 tsp baking soda. Makes 1 tsp baking powder. Use Cream of Tartar in beaten egg whites for Angel Food, Chiffon, sponge cakes, souffles, puffy omelets, meringues, and 7-minute frostings. Use about 1/4 to 1/2 tsp per 4 egg whites. 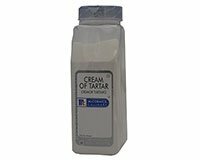 Use 1 to 2 tsp Cream of Tartar in 1 quart water to remove stains aluminum pots. Boil for 10 minutes. In the top of a double boiler, mix 2 egg whites, 11/2 cup sugar, 1/2 tsp Cream of Tartar, dash of salt, and 1.3 cup water. Beat for 1 minute with an electric mixer or rotary beater. Beat over boiling water 7 minutes or until thick. Remove from heat. Add 1 tsp pure Vanilla Extract and beat until spreadable.